Made for outdoor use in harsh environments, the Dell Latitude 12 Rugged Tablet can be taken places that no iPad would dream of going. Even though the Latitude 12 Rugged Tablet isn't the first slate designed to be used under extreme environments, its price makes it disruptive. Starting at $1,600 (£1,027, AU$2,175), the Latitude 12 Rugged Tablet costs significantly less than Panasonic's fully-rugged ToughPad FZ-G1 slate ($2,679, £1,721, AU$3,642) that it competes against. Both tablets have been tested using the MIL-STD-810G specifications to survive four-foot high drops, vibration, shock, high temperatures, high altitude, salt fog, explosive environments and solar radiation. The IP65 rating means that the tablet is protected fully against dust and small jets of water. The Latitude 12 Rugged Tablet comes with an 11.6-inch display, a design choice meant to optimize the tablet's weight, size and usability, explained Umang Patel, Product Manager for Dell's Rugged Business, in a telephone interview. After 18 months of design and testing, Patel found that a smaller screen would diminish the tablet's usability, making it more difficult to interact with menus and lists inside the Windows operating system that powers the Latitude 12 Rugged Tablet. The slate can be configured with 64-bit versions of Windows 8.1 Pro, Windows 8.1, Windows 7, Windows 10 Pro and Windows 10. A larger screen would make the tablet's already large 12.3 x 8.0 x 0.96-inch (312 x 203 x 24 mm) dimensions even bulkier. It would also make the slate heavier than its current hefty 3.57-pound (1.62kg) weight with a single 2-cell battery. This configuration delivers four to six hours of computing time, Patel explained, but you can also add a second battery to the tablet to get up to 12 hours. Adding a second battery would increase the weight. In addition to the rugged features, the Rugged Tablet comes with screen capabilities not found in consumer tablets. These features include an outdoor-readable display and a screen that can be used with gloves. For quick access, the tablet has programmable buttons on the front to launch apps or programs. The screen resolution is capped at 1,366 x 768 pixels, so it's not a full HD panel. The display is protected by Gorilla Glass 3. For field workers who need to capture handwritten notes, drawings or signatures, the Latitude 12 Rugged Tablet also supports an optional digital pen. Rather than using a more powerful Intel Core i3, i5 or i7 processor, Dell opted for a more energy efficient Intel Core M CPU. The CPU is the same type found on Dell's Venue 11 Pro 7000 Series, and it delivers balanced performance and battery life. In our benchmarks, the Core M's performance sits between Intel's Atom processor and its premium Core i series. Even though the Core M processor is designed for fanless operation in consumer systems, the Latitude 12 Rugged Tablet uses an active cooling system. The fan not only keeps the tablet running cool, but it also helps the slate maintain a consistent level of performance, Patel explained. Even with a fan, the Rugged Tablet is still waterproof because the the fan is isolated from sensitive internal components. The tablet comes with 8GB RAM and up to 512GB of storage. The storage isn't upgradable as it's soldered onto the motherboard, Patel said. 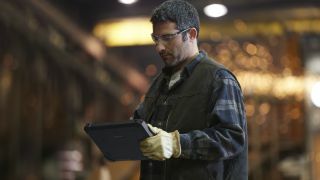 The Latitude 12 Rugged Tablet supports expansion capabilities with rear- and bottom-mounted pogo pin connectors. The bottom-mounted connector can be used to add an optional keyboard dock, similar to Microsoft's Type Cover for the Surface Pro 3. Patel said that the Latitude 12 Rugged Tablet's keyboard cover is unique in that it is spill resistant so that it can be used in tough environments with the tablet. The rear connector can accommodate additional accessories, like a bar code scanner or magnetic stripe reader to turn the Latitude 12 Rugged Tablet into a point-of-sales system. The tablet also comes with USB 3.0, micro serial port, micro HDMI, microSD card reader and stereo audio combo jack. The Latitude 12 Rugged Tablet can be mounted to a car with a vehicle docking solution. Once you get back to your desk, the tablet can be dropped into a charging dock. The desktop dock is also able to charge two spare batteries at the same time. IT administrators can use Dell Client Command Suite to deploy a fleet of Latitude 12 Rugged Tablets, and the slates can stay secure with data encryption, TPM 1.2 support and malware protection with Dell Data Protection.